Copyright ©2007 Sophisticated: The Magazine. All rights reserved. First serial rights granted to Action Pursuit Sports, January 29, 1989.
his prickly bush gives me cover on two sides. And a chance to take a breather. Never mind the muddy knees. Thanks to last week's rainstorm, that bunker over there is quicksand. Must be the seventh battle today, but who's counting? Muffled voices beyond those trees, hoarse and defiant. I hear shots, too. The fire-fight, which started far up-field, has moved this way. Our side is retreating. Doesn't matter, really. I'm bone weary and wheezing like an old man. Which is what I am. Movement in the clearing! Closer now. I've been spotted. Lock and load. Wait. Orange day-glow vest. Hah, it's just Evan, my 10-year-old grandson, goggled and grinning. and giving me a cheery wave. Evan averts his glance, not to disclose my location to the enemy, and strolls across the clearing toward the east boundary to watch the action. Won't be long now, for I can hear furtive commotion near the perimeter of the village. My guess is, a phalanx from the other side has broken through and will make a creeping dash for the flag. Crouch and wait. There's the first guy, half crawling, squinting left then right. You bum! You were looking straight at me. Keep coming. Camouflage really works. Aim, squeeze. Not too soon. The first shot will give away my position. Can't even guess how many there are. Patience. That may be the only advantage of age. No way can I get 'em all. Forestry workers use paintballs to mark trees for felling. That began in the sixties. They shot "airguns," to tag trees. They used real paint and the original propellant was CO2. Splat! Welcome to Chain-saw City -- twelve-hundred board-feet coming down, half a ton of toothpicks and Tuesday's Wall Street Journal. By the seventies cattlemen began leaving their broncs in the pasture and strapping on airguns. They go loping over ranges and feedlots in their pickups using paintballs to mark dogies for whatever they mark dogies for. Splat! Six hundred Big Macks coming up -- plus a dozen designer purses, a closetful of high-heel pumps, and a pair of Florsheims. Some of the ranch hands, as the story goes, took to fooling around, shooting at each other. If that isn't true, it ought to be. The rest is history. Today, paintball guns use compressed air. The technology has taken its place as law enforcement's weapon-of-choice for marking get-away vehicles from whirly-birds. Splat! Wrong Toyota? Sorry, down there. Look at it this way, at least your car will be easier to find in the parking lot. Not a bad idea for training SWAT teams, seems to me. Splat! Oops, I forgot. You were supposed to be the hostage this time. Before long, there will be military exercises using paintball, if not real wars. Imagine Paintball Summitry. Boggles the mind. Splat! Hey, Gorby, you know the rules. That means you gotta pull out of Afghanistan. or me, there were three surprises. First, I expected that "action pursuit games," "tactical commando sports," whatever they're called -- I expected they would be populated entirely by radicals and rednecks, gung-ho types and grungies, frustrated 4Fs, mindless mercenaries and martinets, wackos and weirdos of every stripe. Press coverage of paintball may have been partially responsible for those images. Military implications of "war-games," naturally, is what most people think of. However, I should have known better. It was two of my sons-in-law who introduced me to the sport. Parenthesis. There comes a time just beyond middle years when one becomes preoccupied by one's accomplishments. Or lack of them. Be forewarned. The subject can result in melancholy and a struggle for self-esteem. Not for me. For I have outstanding sons-in-law. You have daughters? Sons-in-law, then, should be your first priority. Nobody ever told me that. Now you know all I know. Thus, however bereft of other achievements, my life's inventory is full enough. You might say my daughters had something to do with the selections. You might say that. So it was Mark and Jason who introduced me to paintball. Accordingly, I should not have been surprised to meet on the paintball field clear-eyed, good-humored, hardworking men -- devoted husbands and caring fathers. Young people mostly, but not exclusively. Not many women, by the way. How curious! Typical of California only, some say. In New England, as many as one in five paintball players are women. Judging from the slick ads in paintball monthlies, their proportions are ample indeed. Second surprise has to do with the atmospherics of the games, which are characterized by neither self-consciousness nor mockery. Take that enthusiast over there, with grease-painted face, the all-over camo outfit, radio-equipped headgear, combat boots, crisscrossed ammo-belts, padded gloves, paintbladder grenades, "constant-air" assault rifle -- why, he's standing by the "PX" sipping a Gatorade and chatting with a fellow in a ragged sweatshirt and jeans, hefting a mere 12-gram rented pistol. They seem to be debating the merits of Mac-II's latest spread-sheet software. he paintball community is utterly egalitarian, thereby distinguished, certainly, from the smuggies you will find queued up for the ski-lift ("Will you get a load of her outfit!"). Or running around on the 'fuzzy-ball' court. Speaking of which, part of the second surprise for me was that the paintball field is devoid of strife and vexation ("You had the court reserved for ten; that was five minutes ago; where the hell were you?"). "Tennis," you will recall, comes from the French for "take that!" Aggression? In paintball? Naah. I have experienced more scowling militance pushing wood over a chessboard. As for paintball sports being childish, get real! Ever watch grownups frolicking in their underwear playing 'bouncy-ball'? Or wearing knickerbockers and running base-paths in a high-paid version of 'stick-ball'? Can you believe the shoulder pads guys wear for 'kick-ball'? And what's with all that romping and snuggling in the grass? Then, too, there's the 'dimple-ball' game, a regimented stroll punctuated by solemnity and self-flagellation. All are sensible adult behaviors, I suppose. 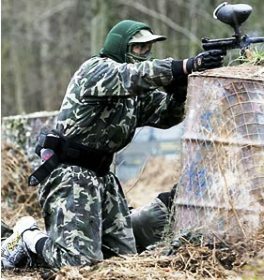 The whole idea in paintball, quite plainly, is to run around outdoors and have fun. Sure, there's the part about shooting. Something like plinking at tin cans, except the tin cans plink back. You're gunning down rabbits, except the rabbits have guns, too. Rules are few. They and the red-shirted referees on the field have one objective: safety. The only complaint I've heard came from an obvious first-timer. "See that guy over there wearing the yellow ribbon?" "Well, I asked him, 'Are you on the blue team?' and he said, 'Sure.' Then he shot me!" "Hmm," said the referee wiping a smirk from his face. "I guess that means you're dead." Weekends, happily, are mostly "walk-on" games. Nonchalance prevails. Outside of tournament play, hierarchy does not exist. "Thirty seconds!" announces the referee, walkie-talkie pressed to his ear. "Goggles on." One mistake I made was mentioning to Son-in-law Mark that the I was going to puke if somebody says "Listen up!" After the whistle, a couple of "squads" may form spontaneously, one sprinting out to guard a flank, the other attacking up the middle. "You coming with me?" someone might ask. So much for organization. Of course, Mark periodically hollers for my benefit, "Listen up!" The referees meander all over the field performing "paint checks" as requested and watching the clock. Games are typically 30 minutes in duration. By the way, spectators are safe enough. Paint costs more than four cents a ball. Third surprise for me was -- now listen up: Nobody seems to care about winning! To be sure, you don't want to get shot, for then you have to put your hand on top of your head and shout, "Dead man, coming out!" while marching ignominously off the field. "Nice shot," you might tell the scoundrel who plugged you. The main problem is that for you the game is over. You have to go back to the registration area and hang around for the next game. That's not so bad, though. Sometimes you strike up a conversation with other dead men -- or women. "That settles it, I'm not going to blow dry my hair before coming out here next time." There was this fellow, not much younger than I, unmistakably Japanese, sitting on a bench cleaning his airgun, beaming with his whole face. "Come out here often?" I asked. Bowing ceremoniously, he suddenly sucked in a breath through his bared teeth and exhaled. "Slee-haw!" was the sound, and it jolted me with atavistic dread. Certifiably wacko, I thought to myself, backing away. I could feel my eyebrows rising uncontrollably toward my hairline. "Actually, I play almost weekly," he replied, pronouncing his l's perfectly. "Crandall's my name. I'm a lawyer. And you?" To win, your team must capture the flag, and sometimes your team does. Mark and I backed up Jason on a lightning strike. We shot our way into the opposing village and grabbed the flag, somebody's torn tablecloth. After a whispered whoop, we ran through the bushes, jumping logs, taking fire all the way back to our own village. The feeling was exhilarating. We swaggered around gasping, giving each other high fives. A tincture of disappointment, though. For us, the game was over ten minutes early. "Hey, that was great. Where we playing next?" "Cambodia again, only this time the yellow team faces the sun and we'll consider the river inbounds." The place is called Sat Cong Village. Located amidst dairy farms near Corona, it comprises 60 acres, part of a nature preserve. Sat Cong is not one of the biggest, by any means. There are a couple of hundred fields in the U.S., some as large as 200 acres. Not bad for a sport that began only in 1981. By the way, England boasts 154 fields, and the sport is gaining popularity throughout Europe and elsewhere. As many as 48 teams show up for a tournament. Playing fields go by such names as "Counter Attack," "Stratego Hill," "Survival Zone," "Scrimmage" -- that last one being a misnomer, since no bodily contact is permitted. The best way to get hurt is to stumble over a log and fall into stinging nettle. Take it from an expert. At Sat Cong, there are five fields, each bearing front-page names, all, one hopes, anachronistic: Cambodia, Russia, Vietnam, Nicaragua, and Beirut -- the last field is a maze of dirt roads, spattered barrels and packing crates made up to resemble buildings. The "embassy" is on top of a hill, the combat objective for one team, rampart for the other. A decrepit golf cart rumbles through the streets pretending to be a fighting vehicle, taking pot-shots at random. "Paintball" itself is a misnomer. "Colored-water-ball" is more like it. About the size of a marble, the ammunition is manufactured in the same machines used to make vitamin capsules for livestock. The outer part is a gelatin, which simply dissolves away next time it rains. A day on the paintball field is like a week at summer camp. What matters more than winning is the camaraderie. And the badinage. "Badinage?" grumped Jason, for no reason except that he felt the way he looked. "We don't got to show you no stinkin' badinage." Mark likes to do a comic impression of his father-in-law. "Come on," I had hollered once, when time was running out and I wanted to create a diversion. "Come on, take your best shot!" Splat! "Dead man, coming out." You're nobody until you have a battle-field name. Mine is "Think Tank," a reference to my size more than to my mental capacity, which, by Mark's account, is miniscule. Sat Cong's field manager, an amiable chap named Ken, chuckled when he saw my splattered belly. "Amazing, isn't it -- the accuracy of those airguns." "Gimme back my twenty bucks, Ken. I didn't give up my macrame class to come out here and let you make fun of me." ne step closer and you've had it, buddy. I hope Evan is watching. Squeeze. Blam. Splat! Next thing you know, there are colored-water-balls, pummeling in from all directions. I'm shooting back as fast as I can, with my WGP Sniper pump-gun. Blam, blam, blam. But I'm not hitting anything. A voice calls out from behind a tree. An interval of calm. Orange and yellow fluid is dripping from the bush onto my goggles. The voice snarls with condescension. "You want to surrender?" The moment I've waited for all my life -- or at least since I saw a certain John Wayne movie. Splat! "Dead -- um, grandfather, coming out."